This is a modified version of an article I was asked to write for The Guardian Teacher Network. What exactly is the Raspberry Pi? Computer Science pioneer, Seymour Papert wrote, “The role of the teacher is to create the conditions for invention rather than provide ready-made knowledge”. The credit-card sized, low-powered Raspberry Pi computer, costing about the same price as a textbook (£18) is one tool that can be used to help create these conditions. Designed and manufactured in the UK, the aim of this computer is to encourage children to tinker and experiment with computing technology at a very low financial risk, but offering massive educational value in return. The unconventional, bare-bones appearance of the Raspberry Pi computer frequently prompts more questions than it answers. In education, that is surely a good thing, for outstanding teaching is more about stimulating children to think and question than simply providing answers to questions. Purchasing a Raspberry Pi computer is just the first step on the voyage of discovery and adventure. Much like baking a cake, there are an amazing wealth of recipes online and different ingredients you can purchase if you want to add to those already in your ‘larder’. For example, to protect your Raspberry Pi in the classroom, you might splash out on a Pimoroni Pibow case or for full on retro-appeal go completely naked (that means un-cased by the way!) After all, the intention of the device is to expose exactly what a computer is, not to hide it away behind some sleek, shiny aluminium and glass. Making it work is the next challenge. You will need an operating system, eg. Raspbian, on an SD memory card. You can either go for the home-baked approach or save a little time by buying a pre-loaded SD card. After switching on, the desktop environment looks something similar to Windows with programming tools including Scratch, Python, PyGame and Midori (a web-browser). How can you blend it into lessons? At these early stages, while we are unlikely to see many schools replacing existing computing classrooms of PCs and Macs by suites of Raspberry Pi computers, the Raspberry Pi certainly has a place in the classroom. In the same way that Lego & Meccano allow children to use their imagination to build models of systems, the Raspberry Pi allows children to develop their own software and hardware solutions, the major difference being that the Raspberry Pi is a real computer, not a Lego toy or a Meccano model. I suggest that teachers launch a classroom discussion by first asking your class to “Agree a definition of what a computer is”. Many will say that a computer must have a keyboard and mouse. “What about tablet devices?” Are you yourself able to answer the question? The next discussion should be “Are computers taking over the world?”, or “Have they already taken over the World?”. As our lives become more reliant on computer technology and our world is dominated more by embedded computers that track our conversations and movement, monitor our spending and viewing habits it is refreshing that the Raspberry Pi foundation have provided an antidote. I regularly meet other teachers at the Raspberry Jam events I attend, driven there in the main by their curiosity. I also get invited to visit other schools and authorities to give talks and workshops on the educational potential of the Raspberry Pi. In November I’ll be flying over to DESC in Dubai to help run a Raspberry Jam event. At this year’s Raspberry Jamboree 2013 conference in Manchester in March, 300 teachers from around the world attended to understand the educational potential of the Raspberry Pi computer. That was where 13 year old Amy gave her talk that’s been watched by 30,000+ people around the world. 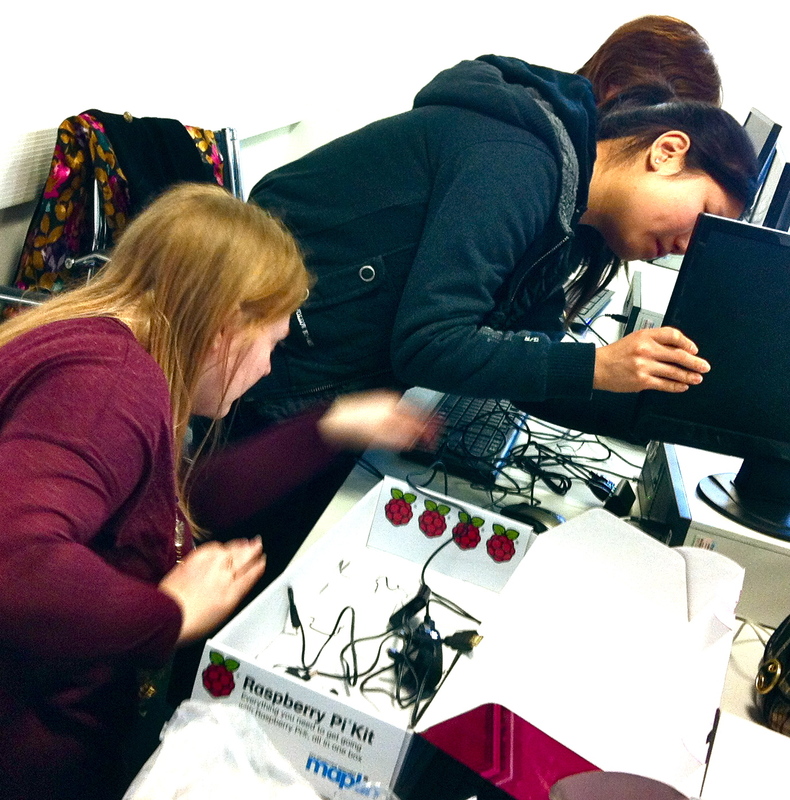 Next year’s Raspberry Jamboree, Feb 28 – Mar 2 2014 looks certain to be even bigger, perhaps we will see you there?